... 900 years ago. Though like all such structures there have been additions, reconstructions and repairs over the centuries the cathedral was, for the most part, built in just 40 years. Despite the changes and repairs over the years the site remains true to it's Norman heritage and overall is considered to be of the Romanesque style. With a significant strategic location sitting high on a promontory above the River Wear and close to the border with Scotland none other than the infamous William The Conqueror saw fit to grant the bishopric the powers of a "Bishop Palatine" in the year 1080 and from that time until the 19th century military as well as religious leadership and power was exercised by the Bishops of Durham. A somewhat different take on the separation of Church and State. 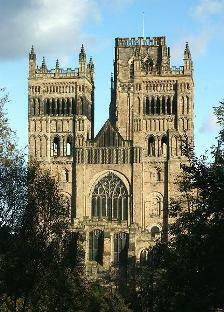 "Durham Cathedral is the greatest Norman building in England, perhaps even in Europe. It is cherished not only for its architecture but also for its incomparable setting. For this reason it was inscribed together with the Castle as one of Britain's first World Heritage Sites. In a nationwide BBC poll held in 2001 it was voted the nation's best-loved building. Like Hadrian's Wall and the Angel of the North, it is an icon of north-east England, its image is instantly recognizable to people who love this part of Britain." 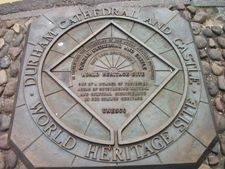 The recipient of many accolades over the years the cathedral has probably never received a greater one than being recognized as a "World Heritage Site" by UNESCO in 1986. 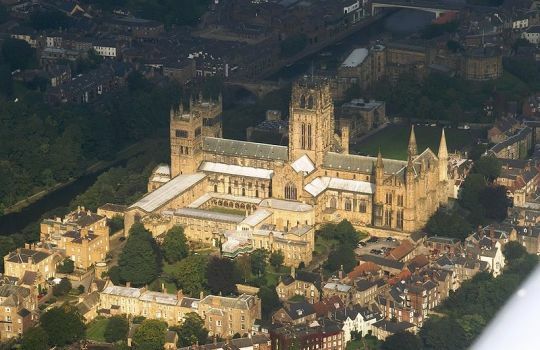 In making the public announcement of the award UNESCO observed that "Durham Cathedral is the largest and most perfect monument of 'Norman' style architecture in England". Perhaps less of an "accolade" but certainly giving the cathedral its biggest ever audience is the fact that it is Hogwarts. 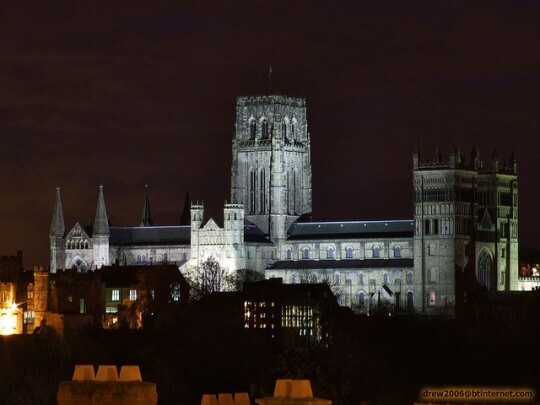 Yes - Durham Cathedral has been featured in the Harry Potter films as "Hogwarts School of Witchcraft and Wizardry" with spires being digitally added onto the top of the famous towers along with other digital modifications. 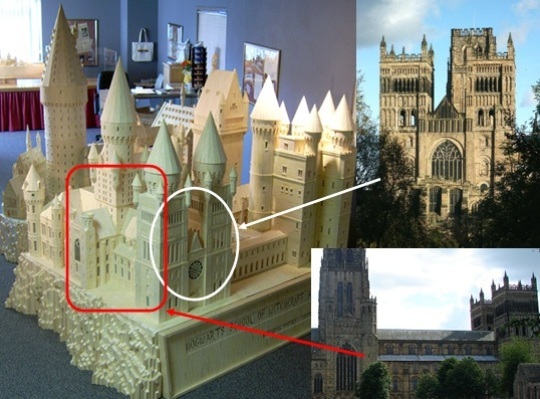 The image below using cuts from original images and an image of a model [see Matchstick Marvels] of "Hogwarts" illustrates how the cathedral was the "base" upon which "Hogwarts School of Witchcraft and Wizardry" was digitally created. As with many of the great medieval cathedrals Durham, with an interior length 469 feet (143 m) and a central tower that rises to 218 feet (66 m), is a massive structure. 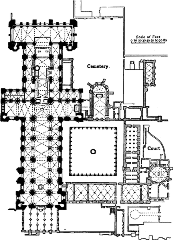 A floor plan of this architectural masterpiece can be seen to the right. We had the pleasure of visiting Durham and its cathedral on a trip back to England a few years ago and the first image is an original. Not being a professional photographer and lacking fancy cameras and lenses it was actually difficult to get far enough away to get the full building in a single shot but we did just about manage it. We have added the cathedral to the Google Earth Tour using the spot we took the picture from; sadly when the Google "street view" car passed by there was obviously an event taking place on the green and there are tents pitched obscuring the view but tracking around a little can get you clear views of the cathedral and its environs. If you ever visit the north of England you should definitely add this to your list places to see; you will not be disappointed. Regular visits here are the best way to thank you for your effort, which is the reason why I'm visiting the site everyday, looking for new, interesting info. Many, many thanks!